As part of my TGC work I had to develop some essential questions for my international field experience in India. One of the first questions I ask my junior/senior students in my Global Studies class is: What is globalization? Students develop an initial definition and then reflect on that definition at the end of the course given what they’ve studied over throughout the trimester. I thought it would be a good idea for me to try and formulate an answer to the same question through my field experience. Essential Questions for India Field Experience: What is globalization? 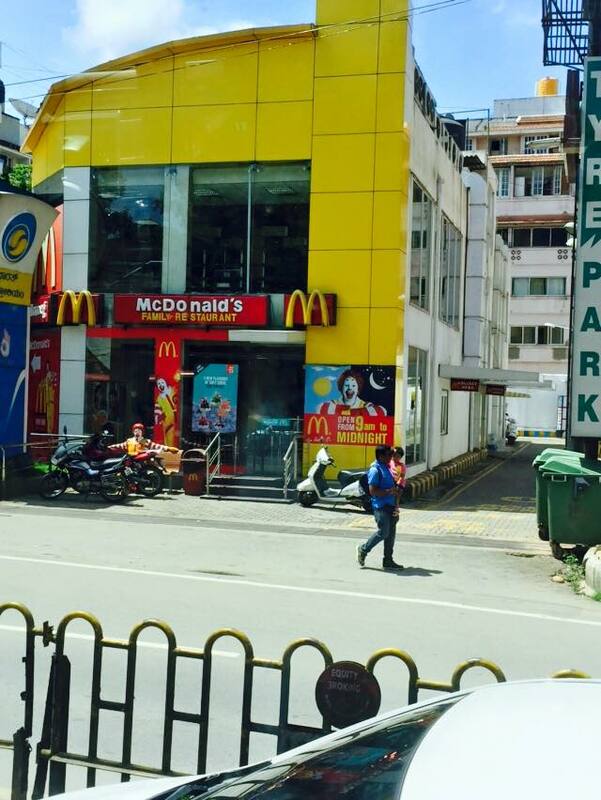 Globalization Reflection: Mangos and McDonald’s: Which would you rather eat? I’ve never really been a big fan of either. Buying the perfect mango here in the US seemed to be impossible for me to get right. They were always hard as rocks and sour. McDonald’s food isn’t much better but sometimes that was the most efficient option during hockey road trips and chicken McNuggets were easy to eat in the car. The first question that I ask my Global Studies students on the opening day of class is what is globalization? It isn’t an easy question to answer. I decided that I would try to answer my own question as part of my Teachers for Global Classroom International Field Experience in India. From reading Tom Friedman’s The World is Flat, I knew that Bangalore was the IT capital of India and much of the United States and Europe’s call centers are located there due to million(s) of English speakers. I knew that major corporations like Coca-Cola, Pepsi, and McDonald’s were globalized so I expected to see the golden arches with some cultural modifications but I wanted to see more. Globalization has existed since people started moving around and sharing ideas, products, and services with other groups of people. One of the first things I discovered is that English is the language of globalization. While we struggle to teach and get students to learn a 2nd language in American schools, Indian children are learning English. (and Bengali, Hindi, Tamil, Kannad, and French depending on one’s region and school) India has over 22 national languages but English is the language of opportunity, advancement, and greater competency. This came through loud and clear in our opening presentation by Maya Menyon of the Teacher Foundation in Bangalore. “English has a unique position in India. Competence in the use of English is the single most important marker of a young person’s eligibility for negotiating the opportunity structure that the modern economy has made available.” (Kumar, 1996) Students were learning English in every school, government and private, I visited. The high school students at Shri Shikshiyatan School in Kolkata spoke and wrote English very well and many of them were fluent in 3 or 4 other languages. If the second most populous country in the world views learning English as a top priority for global success, what does that mean for my students? Many of them wonder why they “need” to learn another language.”I’m never going to Spain. Why do I need to learn Spanish?” (insert a whiny 15 year old voice here) World Language programs routinely suffer budget cuts unlike math or science programs. I, of course, can argue that learning another language opens the mind to new ways of thinking, problem solving, and increasing exposure to other cultures. In our rural area, this is vital. In my limited global travel experiences, I’ve never been forced to try and communicate in a language other than English to have important needs met. Does globalization mean that English is the official global language? 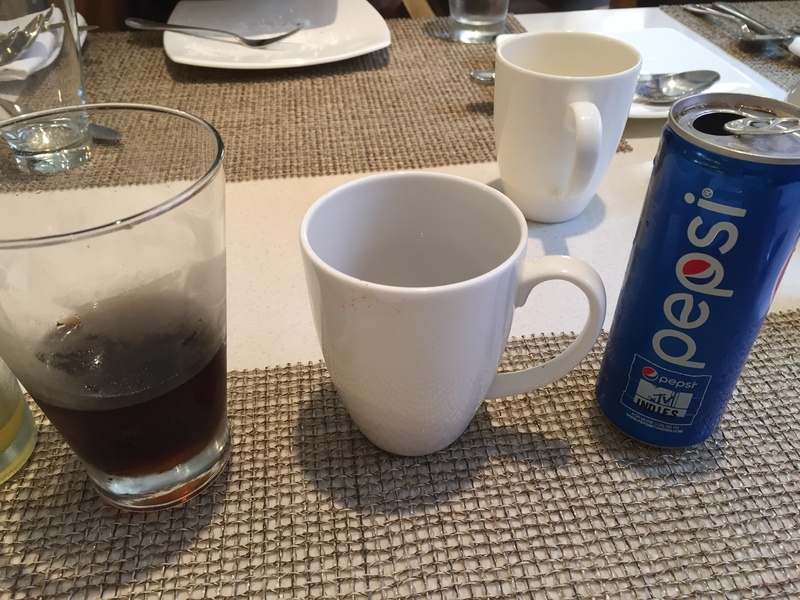 While traveling through Bangalore, Kolkata, Delhi, and Agra I saw hundreds of signs advertising both Coke and Pepsi. From large billboards to tiny signs adorning small hole in the wall shops, Coke and Pepsi are everywhere. As an American who was warned not to drink tap water, Coke and Pepsi were safe and welcoming alternatives. The big difference is the lack of high fructose corn syrup as an ingredient and the aluminum cans used are smaller than the 12oz American can. The cost is similar to the US which makes Coke and Pepsi rather expensive for the 59% of Indians living on less than $2.00 per day. The rising middle class (50-300 million people) is challenging traditional life and expanding their brand consumerism especially in urban areas. (Luce, 36) The global opportunity for not only American brands is exceptional but the process of gaining approval from the Indian government can be glacial for some companies. While I noticed McDonalds, Taco Bell, KFC, Dunkin’ Donuts, Pizza Hut, Au Bon Pain, TGI Friday’s and many other American fast food entities, I did not see a Wal-Mart. Ever. According to Luce’s In Spite of the Gods: The Rise of Modern India, “…the Indian market is probably the most lucrative final frontier.” (35) India so far is keeping American retail giants out to protect the “millions of “mom and pop” stores that line the streets.” (Luce, 35) Now that I think about it, all of the shops and markets that I went to in Bangalore, Kolkata, and Delhi were Indian. I did not see any big box retailers even on the outskirts of the cities like we do here in the U.S. 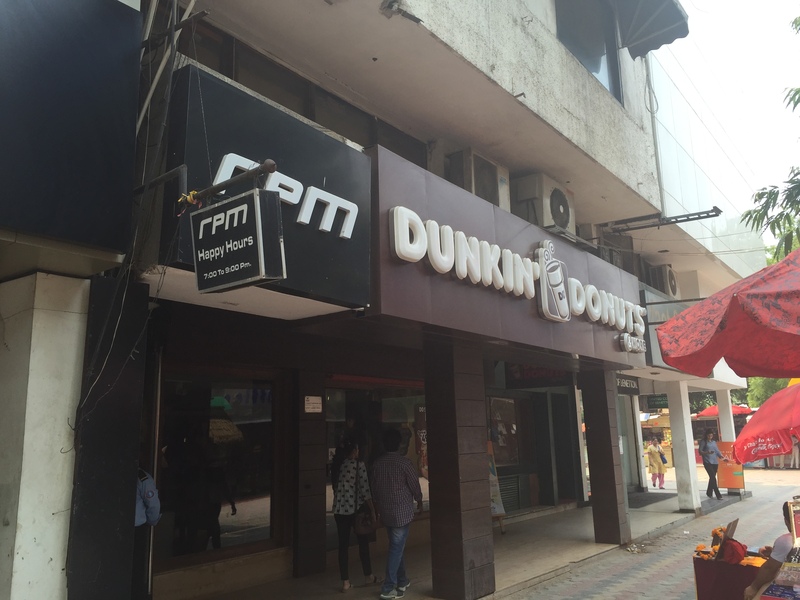 The closest thing was the mall in Delhi near our hotel that had the luxury brand retailers. 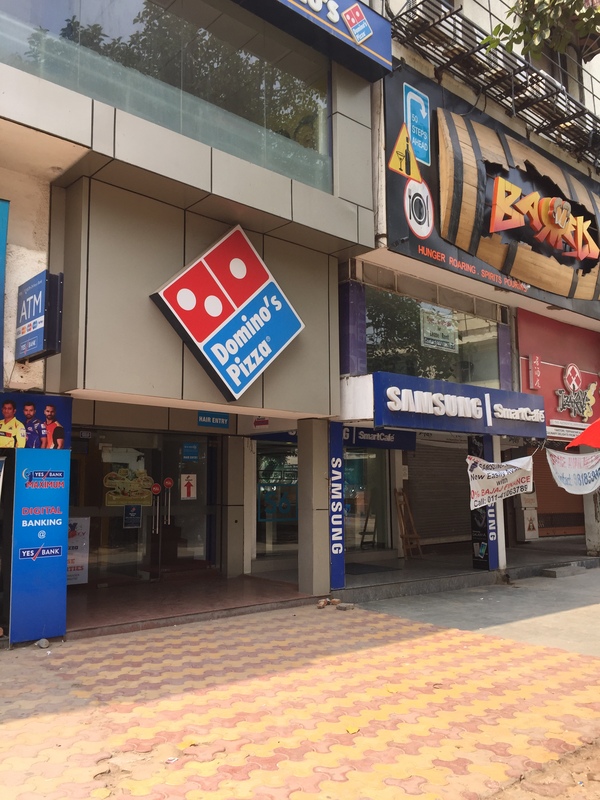 When we were driving from Delhi to Agra, I didn’t notice the ubiquitous strip malls of Lowe’s/Wal-Mart/Kohl’s/Michael’s/Bed Bath & Beyond/Best Buy which was really refreshing. For my teacher in-service activity, I needed scotch tape. Kim, Melinda and I took a walk around the block from our hotel in Kolkata and came across a “mom and pop” office supply store/stall/closet where I found my tape and Melinda found a flash drive. No Staples needed! I can see why Wal-Mart is desperate to get into India but the impact on the small street businesses would be drastic. While having the ability to access American brands like Coke and McDonald’s throughout the world is comforting at times, it is important to break out of the globalized zone and go for local and regional foods and products. This is where real learning and understanding happen. 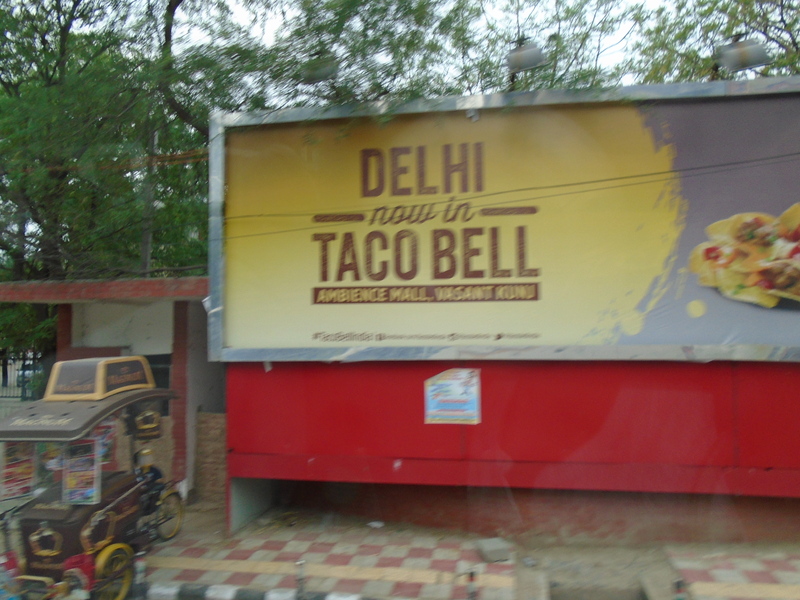 Disclaimer: I did, on the last day in Delhi, go to the McDonald’s next door to the hotel. I was really curious to see the difference. 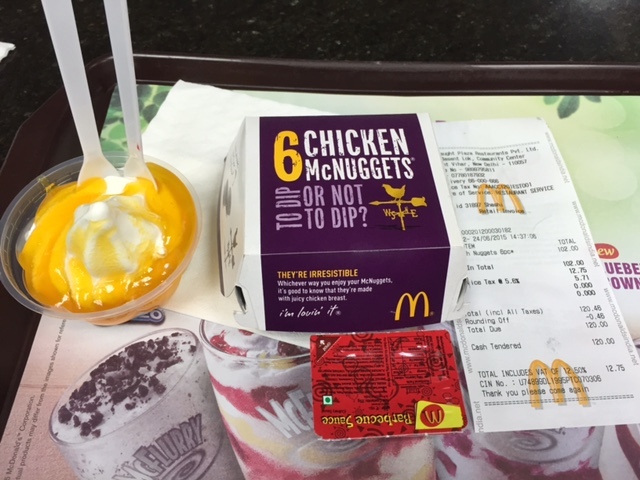 My colleague Sarah ordered the Mango Sundae and I ordered the 6 piece Chicken McNugget with barbeque sauce. The experience was disappointingly the same as in the US. As globalization progresses further, what are we losing? I need to consider this further even here in the US. Do I go to the ubiquitous strip mall because it is cheap and efficient or do I spend a little more time and effort seeking out the local “mom and pop” shop and building a relationship with them? What is the balance? I haven’t completely answered my question. Yet. It is one that I continue to think about. I was impressed by the mix of western and Indian clothing among the residents of Bangalore, Kolkata, and Delhi. The students at Shri Shikshiyatan School were well aware and versed in international affairs, more so than many of my students. India has the potential to be a global democratic powerhouse but people still live under the flyovers or in slums while others shop at Louis Vuitton. I guess that isn’t any different than the U.S. but it is more out in the open. The coexistence of over a billion people with so many different languages, religions, levels of education and wealth and social status is amazing. We could learn something from that in our polarized political climate. As Luce writes in In Spite of the Gods: The Rise of Modern Indian, “India’s economy offers a schizophrenic glimpse of a high-tech twenty-first-century future amid a distressingly medieval past.” (58) It will be fascinating to see how India continues to emerge in the coming years and the impact globalization continues to have. What about those mangos? 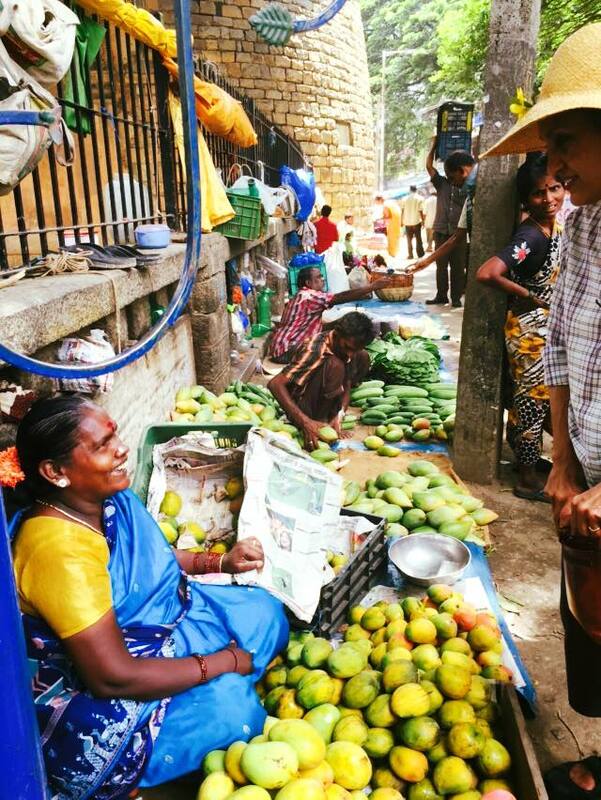 While we were waiting for our bus on the horribly busy street corner in Bangalore next to Tippu Sultan’s Fort and Victoria hospital, there was a woman with her blue tarp spread out selling mangos. There were overflowing baskets of mangos. I had mentioned to Maya that I had never eaten a decent mango so she purchased half a dozen, knowing exactly which ones to select and handed me the bag. Back at the hotel, I asked our lunch waiter to have them cut up. Wow. Beautiful yellow color, perfectly ripe, deliciously sweet, they were incredible. I’ve been looking, but in this globalized world, I haven’t been able to replicate that mango experience yet. I guess I’ll have to return to India for that. Krishna Kumar (1996): Learning from Conflict – Tracts for the Times. Quote taken from Maya Menyon & the Teacher Foundation Powerpoint on India’s Education System, June 2015. Luce, Edward. In Spite of the Gods: The Rise of Modern India. Anchor Books, New York. 2012.